Ukraine's Foreign Ministry has expressed contempt at the decision of a Russian court to arrest ex Prime Minister Arseniy Yatseniuk (leader of People's Front Party) in absentia and called on the world community to increase pressure on the Russian Federation. "The absurd accusations and criminal proceedings have nothing to do with reality or common sense. This is another example of the complete degradation of the Russian state system, which has transformed justice into an obedient instrument to justify Russian aggression against Ukraine," the press service of Ukraine's FM said on Tuesday. As earlier reported, on March 27 Yatseniuk said the Yessentuki City Court, Stavropol territory, Russian Federation agreed to review an appeal by the Investigative Committee of the Russian Federation on his arrest for being a member of an armed group, committing crimes, including premeditated murder. 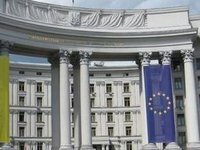 The court, however, refused to inform Ukraine's consulate in Rostov-on-Don of its decision on the matter. Ukraine's Justice Minister on March 28 said his ministry would ask for clarification about illegal decisions taken by Russian courts regarding citizens of Ukraine, including the so-called "in absentia" case involving Yatseniuk.